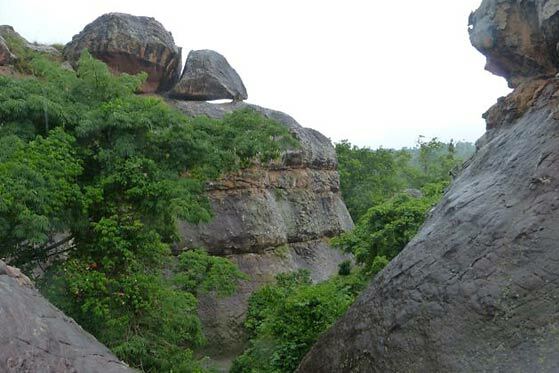 Agricultural land-use change in Ghana may be affecting Eidolan bat roosting and feeding patterns, and thus direct and indirect bat interactions with people and livestock. This would have potential impact on the incidence of henipavirus. Based on ecosystem services practices, high-risk groups are differentiated by factors such as gender, age, social status and wealth. Links to urban areas may also be important. 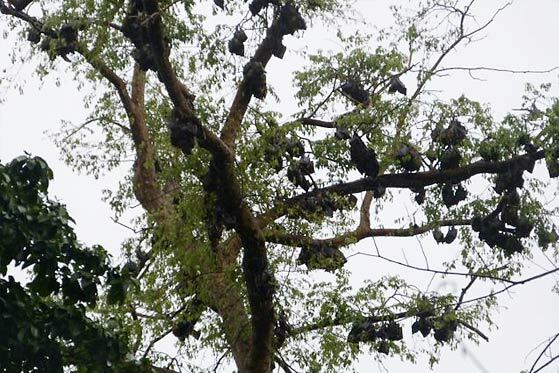 Bats occur in all agro-ecological zones with most roosts in cities and towns where there is a high possibility of human interaction and therefore a higher likelihood of disease spillover. This scenario envisages that increasing population and land demands lead to a loss of suitable habitats for bat roosting. Furthermore, hunting leads to a massive reduction in Eidolon bat numbers. The change in species composition of hunted bats would lead to altered exposure to different viruses, including Ebola. A decrease in bat populations would also affect seed dispersal and reduce forest regeneration, with consequent impacts on biodiversity and ecosystem services. Outbreaks of henipavirus infections could still be large if they reach farmed pig populations and policy changes would be needed to eliminate fruit trees on pig farms. These risks would be increased by agricultural intensification. Better education of women could lead to a reduced disease risk for women in the bushmeat trade, as well as a decrease in the cooking and consumption of bats. Increased diagnosis of bat-virus related outbreaks in people, as well as possibly in pigs and other livestock, would lead to altered perceptions of the risks of bat populations. This scenario envisages that projected changes in precipitation impact farming practices and increase cashew, mango, maize and millet production. This could lead to unpredictable impacts on the fruit trees, such as neem trees, which provide food for bats. Bat populations could increase. Impacts on livestock farming could also see growing number of pigs, potential virus hosts, leading to increased risk of disease spillover. Loss of habitat for other wildlife could lead to decreased biodiversity, e.g. fewer duikers, resulting in a greater hunting of bats, and so more human-bat interactions. Bat movements could also be altered. Eidolon bats could become permanently resident in large numbers in city sites, again leading to increased human-bat interactions. Women’s role as nurturers and carers in the community would be significant. Assuming that bushmeat is the main source of spillover risk, it could mean that greater spillover disproportionately impacts women and children. This scenario envisages a move from subsistence to commercial farming, accompanied by a loss of indigenous crops. Women farmers, more involved in subsistence farming than cash crops, would be marginalised. Land grabbing could increase land use changes, in particular with plantation development. This would lead to soil degradation and increased pesticide use. With the land conversion would come changes in bat habitat, as bats tend to feed more on farmed rather than forestlands. Globally, pig farming is likely to increase, although it is uncertain if this would happen in Ghana because of the wide-ranging religious beliefs associated with bats. In either case, there could be substantial impact on spillover risks. Positive impacts could include increased income for the country, both at national and local levels, leading to better access and infrastructure, with less exposure to diseases and better detection. However, increasing poverty of marginalised subsistence farmers would reduce health-seeking behaviours. With reduced diagnosis and surveillance there would be increased risk of spillover for vulnerable groups. 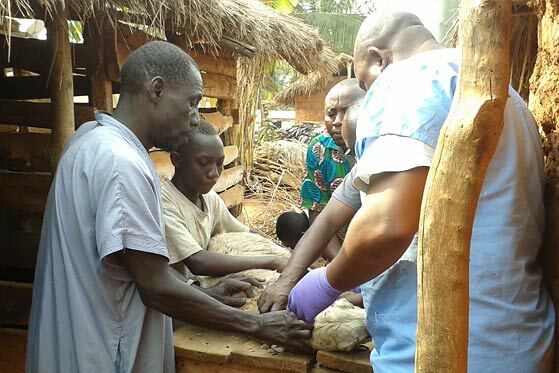 This scenario envisages increased surveillance and collaborations in line with One Health thinking. Better understanding of risks could improve preventive and mitigating measures and education for the broader population. Identification of unknown diseases would increase, but there could still be struggles to diagnose unknown infections. However, increased diagnoses might not be available for all. When available, greater expectations for therapy might not be fulfilled. With only partial understanding of risks, it could lead to the unjustified persecution of wildlife. One Health could further lead to possible habitat degradation due to BIU complicating the trade-offs. Major shift of funding to One Health could also impact other sectors negatively, including those of education and food security. 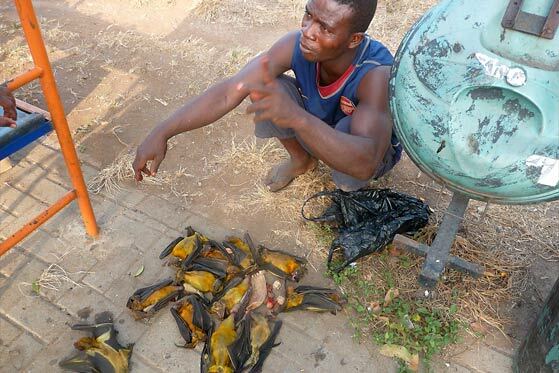 Hunters (mainly men) and traders (mainly women) could have their livelihoods affected. The impact would most likely be greater for women who often rely on trade and chop bar operation (roadside food stands), rather than men, for whom hunting is mainly a part-time occupation. In Ghana, the first surprise identified would be an Ebola outbreak. This would elicit increasing awareness of zoonotic diseases leading to fewer human-bat interactions. The 2014 Ebola outbreak elsewhere in West Africa makes this a very realistic threat and a major driver of health policy on the continent. The epidemic has caused consternation and behaviour change, and may result in substantially increased surveillance and interest from public health officials. Ebola is understood as a serious problem. However, it is also believed that all transmissions are from bats even if all cases, apart from the initial spillover case, are due to human-to-human transmission. Results from Gabon suggest that spillover of Ebola to people can be common in rural regions, but remains undiagnosed. The second surprise would be that henipavirus impacts pig production. This has happened with Nipah virus in Malaysia. Viral spillover on agriculture, and specifically pig production, could negatively impact food security. This would further affect livelihoods in a broader sense than just the common perception of virus spillover from wildlife directly impacting public health. Reduced pork consumption could hit pig farmers and subsistence farmers, as well as the national economy more generally. The team in Ghana identified climate change as an overarching driver affecting all others. Food prices and population increase are perceived as major drivers in this system. Move the cursor over each driver, and see how these interact. To compare with another country go to the interacting drivers page. Prof Yaa Ntiamoa-Baidu, University of Ghana (country lead); Prof Andrew Cunningham, Institute of Zoology; Dr Elaine T. Lawson, University of Ghana; Kofi Amponsah-Mensah, University of Ghana; Dr Richard D. Suu-Ire, Forestry Commission of Ghana, Wildlife Division; Prof James Wood, University of Cambridge.